No video game is complete without some sort of glowing orb, and Omnic monk Zenyatta is Overwatch’s prime source of lighted spheres. Japanese toymaker Good Smile Company understands this. That’s why their new Zenyatta figure has all of the orbs. 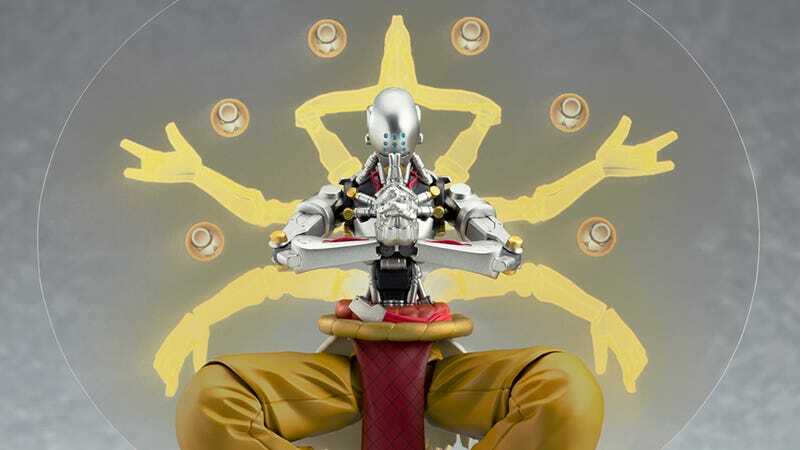 Now available for preorder for about $80 USD with a release planned for next summer, this highly articulated and ball-laden Zenyatta joins Tracer, Genji, Widowmaker, Reaper, and D.Va as the latest addition to Good Smile’s Figma line. He’s a premium format figure, which means he comes with a hell of a lot of hands — 14 different hands, in fact. Joined hands, pointing hands, attacking hands, one hand in his pocket and the other making a peace sign. You get the idea. This is what it all boils down to. As you can see in the picture above, he also comes with his ever-present satellites. Nine orbs set in a plastic ring to give the illusion that they are floating about Zenny here. It’s a good look, and they are good orbs. But wait, there are more. How about the healing yellow glow of the Orb of Harmony? Or the deep purple pain of the Orb of Discord? And no orb-wielder would be complete without the blue Orb of Destruction. Note how it takes the place of one of the metal ones on his ring. Clever design there. And finally we have Zenyatta’s ultimate, Transcendence. This effect is achieved with a transparent piece of plastic. He’s already got 14 different hands, not like they were going to pack in six more arms. He’s a pricey little machine monk, but glowing orbs never come cheap.